Birds also known as Aves, are a group of endothermic vertebrates, characterised by feathers, toothless beaked jaws, the laying of hard-shelled eggs, a high metabolic rate, a four-chambered heart, and a strong yet lightweight skeleton. Birds live worldwide and range in size from the 5 cm (2 in) bee hummingbird to the 2.75 m (9 ft) ostrich. They rank as the world’s most numerically-successful class of tetrapods, with approximately ten thousand living species, more than half of these being passerines, sometimes known as perching birds. Birds have wings which are more or less developed depending on the species; the only known groups without wings are the extinct moa and elephant birds. Wings, which evolved from forelimbs, gave birds the ability to fly, although further evolution has led to the loss of flight in flightless birds, including ratites, penguins, and diverse endemic island species of birds. The digestive and respiratory systems of birds are also uniquely adapted for flight. Some bird species of aquatic environments, particularly seabirds and some waterbirds, have further evolved for swimming. Reverse genetic engineering and the fossil record both demonstrate that birds are modern feathered dinosaurs, having evolved from earlier feathered dinosaurs within the theropod group, which are traditionally placed within the saurischiandinosaurs. The closest living relatives of birds are the crocodilians. Primitive bird-like dinosaurs that lie outside class Aves proper, in the broader group Avialae, have been found dating back to the mid-Jurassic period, around 170 million years ago. Many of these early "stem-birds", such as Archaeopteryx, were not yet capable of fully powered flight, and many retained primitive characteristics like toothy jaws in place of beaks, and long bony tails. DNA-based evidence finds that birds diversified dramatically around the time of the Cretaceous–Palaeogene extinction event 66 million years ago, which killed off the pterosaurs and all the non-avian dinosaur lineages. But birds, especially those in the southern continents, survived this event and then migrated to other parts of the world while diversifying during periods of global cooling. This makes them the sole surviving dinosaurs according to cladistics. Some birds, especially corvids and parrots, are among the most intelligent animals; several bird species make and use tools, and many social species pass on knowledge across generations, which is considered a form of culture. Many species annually migrate great distances. Birds are social, communicating with visual signals, calls, and bird songs, and participating in such social behaviours as cooperative breeding and hunting, flocking, and mobbing of predators. The vast majority of bird species are socially monogamous (referring to social living arrangement, distinct from genetic monogamy), usually for one breeding season at a time, sometimes for years, but rarely for life. Other species have breeding systems that are polygynous (arrangement of one male with many females) or, rarely, polyandrous(arrangement of one female with many males). Birds produce offspring by laying eggs which are fertilised through sexual reproduction. They are usually laid in a nest and incubated by the parents. Most birds have an extended period of parental care after hatching. Some birds, such as hens, lay eggs even when not fertilised, though unfertilised eggs do not produce offspring. Many species of birds are economically important as food for human consumption and raw material in manufacturing, with domesticated and undomesticated birds (poultry and game) being important sources of eggs, meat, and feathers. Songbirds, parrots, and other species are popular as pets. Guano (bird excrement) is harvested for use as a fertiliser. Birds prominently figure throughout human culture. About 120–130 species have become extinct due to human activity since the 17th century, and hundreds more before then. Human activity threatens about 1,200 bird species with extinction, though efforts are underway to protect them. Recreational birdwatching is an important part of the ecotourismindustry. A nest is a structure built by certain animals to hold eggs, offspring, and, occasionally, the animal itself. Although nests are most closely associated with birds, members of all classes of vertebrates and some invertebrates construct nests. They may be composed of organic material such as twigs, grass, and leaves, or may be a simple depression in the ground, or a hole in a rock, tree, or building. Human-made materials, such as string, plastic, cloth, or paper, may also be used. Nests can be found in all types of habitat. Nest building is driven by a biological urge known as the nesting instinct in birds and mammals. 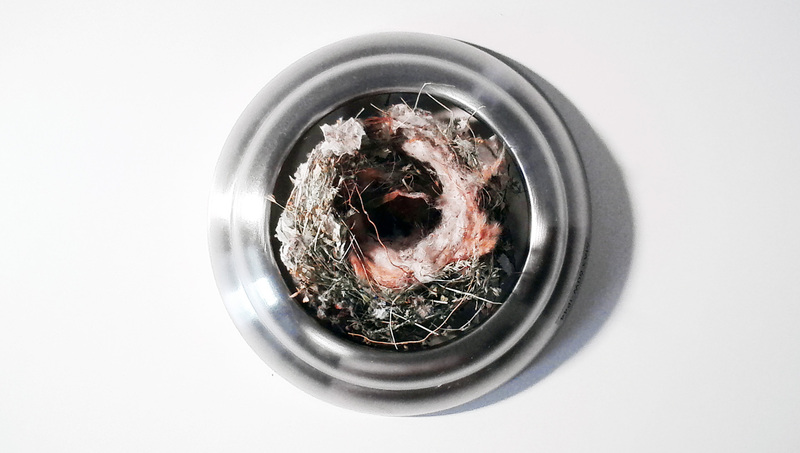 Generally each species has a distinctive style of nest. Nest complexity is roughly correlated with the level of parental care by adults. Nest building is considered a key adaptive advantage among birds, and they exhibit the most variation in their nests ranging from simple holes in the ground to elaborate communal nests hosting hundreds of individuals. Nests of prairie dogs and several social insects can host millions of individuals. Aluminium or aluminum is a chemical element with symbol Al and atomic number 13. It is a silvery-white, soft, nonmagnetic and ductile metal in the boron group. By mass, aluminium makes up about 8% of the Earth's crust; it is the third most abundant element after oxygen and silicon and the most abundant metal in the crust, though it is less common in the mantle below. The chief ore of aluminium is bauxite. Aluminium metal is so chemically reactive that native specimensare rare and limited to extreme reducing environments. Instead, it is found combined in over 270 different minerals. A porthole sometimes called bull's-eye window or bull's-eye, is a generally circular window used on the hull of ships to admit light and air. Though the term is of maritime origin, it is also used to describe round windows on armored vehicles, aircraft, automobiles (the Ford Thunderbird a notable example) and even spacecraft. On a ship, the function of a porthole, when open, is to permit light and fresh air to enter the dark and often damp below-deck quarters of the vessel. It also affords below-deck occupants a limited, but often much needed  view to the outside world. When closed, the porthole provides a strong water-tight, weather-tight and sometimes light-tight barrier. A porthole on a ship may also be called a sidescuttle or side scuttle (side hole), as officially termed in the International Convention for the Safety of Life at Sea. This term is used in the U.S. Code of Federal Regulations. It is also used in related rules and regulations for the construction of ships. The use of the word "sidescuttle" instead of "porthole" is meant to be broad, including any covered or uncovered hole in the side of the vessel.